Lunar New Year #10: Contains the tank, and 1 garage slot. More details about the bundle, including the price, can be found below. Enjoy! The T-34-3 is a Tier VIII Chinese medium tank. This tank is a variant of the T-34-2, a Chinese credit tank and also its successor in the real world. Like all improved variants, the T-34-3 outshines its older brother in every single way in the game, featuring improved armour, weapons and mobility. The main gun of the T-34-3 is undoubtedly the highlight of the tank, as it is taken directly from the 112. 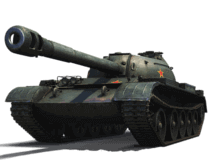 This means that the T-34-3 can potentially - with the use of premium HEAT rounds - achieve the same 250 penetration rating as the heavy tank, which is more than enough to pierce the armour of any medium tank in the field. Because of its strengths, most players consider this a worthy alternative to the Type 59 medium tank.